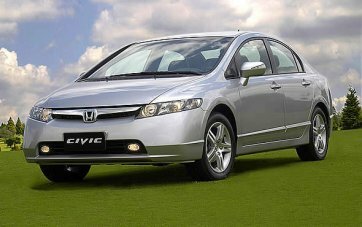 The Honda Civic is a compact car manufactured by Honda. It was introduced in July 1972 as a two-door coupe, followed by a three-door version that September. With transverse engine mounting of its 1169 cc engine and front-wheel drive like the British Mini, the car provided good interior space despite overall small dimensions. Early models of the Civic were typically outfitted with a basic AM radio, a rudimentary heater, foam-cushioned plastic trim, two-speed wipers and painted steel rims with a chromed wheel nut cap. The current Civic has become much more luxurious with satellite-linked navigation, a six-speed manual transmission, air conditioning, power locks, and power windows. 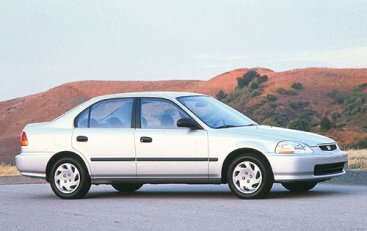 In the United States of America, the Civic is the second-longest continuously-running nameplate from a Japanese manufacturer; only the Toyota Corolla, introduced in 1968, has been in production longer. The 2008 Civic GX sports a Drive-by-Wire™ throttle system and 113-hp, 16-valve, i-VTEC® engine. This clean natural-gas-fueled machine also features the latest, next-generation i-VTEC technology, giving you more power than you’d expect from a smaller engine. The GX was named an Advanced Technology Partial-Zero-Emission Vehicle (AT-PZEV) by the California Air Resources Board. So it came as no surprise that the U.S. EPA recognized the natural-gas powered Honda Civic GX as the world’s cleanest internal-combustion vehicle.† Fuel economy is also enhanced with the 5-speed automatic transmission. Sophisticated active and passive safety features combine to help prepare you and your passengers for driving in an unpredictable world. The Civic GX enhances your visibility to others by incorporating Daytime Running Lights (DRL) up front. To help you maintain steering control during hard stops, an anti-lock braking system (ABS) is standard. The Electronic Brake Distribution (EBD) system in the Civic GX takes into account how the car is dynamically loaded, and apportions braking force appropriately. Honda is committed to providing safety for everyone—not only for our own drivers and passengers, but also for other vehicle occupants and pedestrians. Using the knowledge gained from going beyond government regulations to study real-world situations, Honda identifies new technologies that ultimately help to provide safer vehicles on roadways for everyone. The Honda Civic Hybrid is a hybrid version of the Honda Civic sedan. 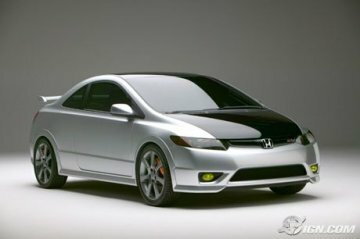 For the 2003 model of the Civic, Honda added a continuously variable transmission and an Integrated Motor Assist hybrid system similar to that of the Insight, creating a fuel efficient hybrid sedan. It is an assist hybrid. Along with the conventional Civic, it received updated styling for 2004. It was redesigned in 2006 and based on the new Civic platform.